This Orange LED Light Strip is perfect for truck, trailer and other vehicles. 1. This LED Light strip uses super high intensity Orange LEDs. Orange is not a widely used color in the market, so sometimes it is difficult to get LEDs in time, especially when companies don’t have reliable LED sources. Even though they get 2. The LEDs, the LEDs from different batches may vary a lot in intensity and color. Since we are using a lot of Orange, these issues have been avoided. 2. 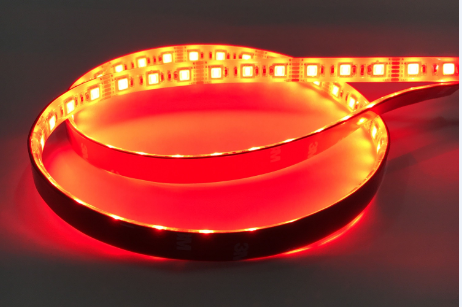 Our Orange LED Light strip uses 4 ounce copper PCB which takes the higher Current. The most common PCB in the market is 2 ounce copper. Of course, there are much more filthy ones like a thin paper. I can't imagine how it works. 3. The solder paste we use is lead-free. In the market, most of the LED Light strip exported from China use solder paste with lead in it. The reason is that lead solder paste has strongly adhesiveness. For flexible PCB, to use That is why a lot of suppliers have solder paste with With Lead. We all know lead is harmful to people, especially to kids. 4. The LED Light strip is completely coated so it is water resistant and it can be used outdoors.